The motorbikes will be moved in and out of the customer’s garage via the double doors in the front gable, and then the single door to the back of the garage will be used as a personnel door to allow easy access to the storage area. A roof overhang over the front gable adds a bit of style to the building and offers some shaded protection for the double doors. Heavy duty felt has been used on the roof, which is a thick, propane torched-on felt for extra durability. 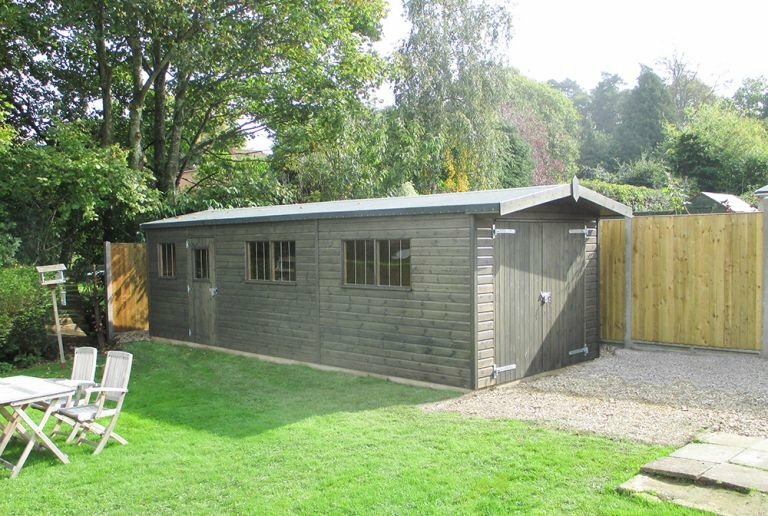 The garage has been painted in our Sikkens timber stain, in the colour, Grey for a neutral look that helps the building to blend in with the garden. A security pack has also been added, which consists of a seven lever lock and heavy duty sliding bolt, security screws for the door hinges, and stainless steel window bars, to keep the customer’s motorbikes protected. 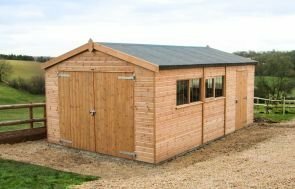 To learn more about our buildings, or to discuss your requirements with us, please contact us online, or create your own bespoke garden building using our online price builder.